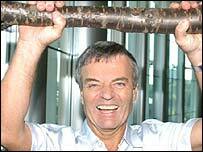 DJ Tony Blackburn has been suspended from his radio job for playing Cliff Richard records against station policy. He defied bosses at Classic Gold Digital by playing two of Sir Cliff's songs back-to-back, after tearing up a warning note from his boss on air. A spokesman for Blackburn said he was disappointed at his suspension and conceded he may have made a mistake. 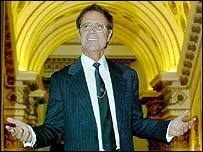 A spokeswoman for Sir Cliff said the singer was at the Wimbledon tennis tournament and unavailable for comment. Blackburn's spokesman confirmed reports of a conflict between the DJ and the station over its musical policy. The 61-year-old former BBC Radio 1 DJ was called into a meeting on Monday and warned not to play any more Sir Cliff songs. But on Tuesday he played the singer's 1963 number one Summer Holiday, leading to an e-mail from head of programmes Paul Baker. "We shouldn't be playing Cliff Richard," Mr Baker wrote. "We might carry out research on him, but for now we have a policy decision that he doesn't match our brand values. He's not on the playlist, and you must stop playing him." On his Wednesday breakfast show, Blackburn read a print-out of the e-mail live on air. He then tore it up, threw it in the bin and played two more chart-toppers by Sir Cliff - Living Doll (1959) and We Don't Talk Any More (1979). Classic Gold managing director John Baish e-mailed him immediately, warning: "This is really serious now." He followed it up with an e-mail confirming Blackburn's suspension. "You're consistently breaking the station's music policy. We've made our position as clear as we could. I've got no option except to suspend you until the situation can be resolved," he wrote. Blackburn's spokesman said the 61-year-old DJ was "sorry" about defying the station's wishes. "He respects the management's decision - he isn't here to cause a massive row," he said. "He's disappointed obviously - he's been broadcasting for 40 years now." Mr Baish said Blackburn would not be doing his show on Thursday to allow the two sides "breathing space" to settle their differences. "Tony believes Cliff has some great songs and was trying to test out public support," he said. "Doing it on air isn't the best way to take those decisions - we have some very sophisticated research." Mr Baish added: "We should be able to sort this out. I'm not angry. I love Tony - really, he's a sweetheart." Blackburn joined the breakfast show in May last year and has an audience of 400,000 listeners. Blackburn was voted Oldie of the Year in 2003 and won the 2002 edition of TV reality show I'm a Celebrity... Get Me Out Of Here.